There has been a lot of discussion on line and in the media about the Moonman’s 2016 show and not a lot of it is positive. Thankfully Lawrence Mooney and last night’s audience at the Athenaeum did read any of these comments. 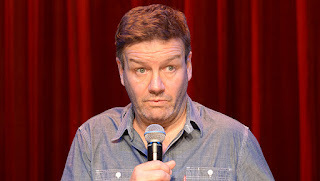 The audience was ready and willing for Mooney to be funny and he delivered in spades. Sure he was crass , brutal and politically incorrect – but funny. He was self deprecating, irreverent and bullish, all at the same time. Everything Mooney promises to be every time he steps on stage. His physicality, particularly that left eyebrow elicits every last laugh from his wonderful stories. A highlight in the show is his take on Australia’s current crop of political leaders.